A Mother’s Advice To Her Son And Daughter by Anne Thérèse de Marguenat de Courcelles Lambert (marquise de). Madame de Lambert was very interested in education and she wrote first A Mother’s Advice To Her Son, and later A Mother’s Advice To Her Daughter for her children as they prepared to leave adolescence and become adults. She wrote them for private use and was very upset when the books were published from copies she had given to her friends. They were both written at the beginning of the 18th century so a lot of the advice is now outdated as it centers on those virtues that were necessary to aristocratic men and woman at the time: glory and honour for men pursuing a military career and humility and domestic and intellectual virtues for women. But there is also a lot of advice that’s still useful and very relevant today and focuses on values and morals, the importance of being honest and polite, and warns us against gambling, envy and the dangers of a life of pleasures only without duties. The book is very enjoyable but still makes you reflect on what’s really important. It is also very short and flows easily. You can easily read it all in an hour. 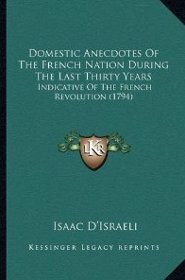 Domestic anecdotes of the French nation during the last thirty years: indicative of the French revolution by Isaac Disraeli. This book investigates the causes of the French Revolution by sharing anecdotes, taken from memoirs, books and journals of the time, of the French nation in the thirty years prior to the French Revolution. The anecdotes are divided into different sections (philosophers, clergy, King, Queen, to name a few) and portray the injustices the rich perpetrated against the poor and the extravagance and luxury of their lifestyle at a time when most of the population was starving. It’s a very interesting read and would be quick too if it wasn’t for the use of the long S, which may make reading a bit difficult for the modern reader. The Letters of Queen Victoria, Vol 2 (of 3), 1844-1853. This is a selection from Queen Victoria’s correspondence between the years 1844 and 1853. 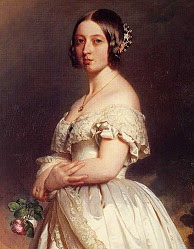 Some are private letters, like those she sends to her uncle, King Leopold I of the Belgians, in which she discusses both personal and state matters, others are letters addressed to her ministers or foreign sovereigns. Some of their replies are also included. You can read about her frustrations with some of her ministers, the endless discussions about the corn laws and the difficulty in creating new governments, but also get a glimpse of a more personal side of this Queen and of the unbounded love she felt for her husband Albert. A very interesting and wonderful read for all interested in Queen Victoria. In this book Patrick Kennedy collects and narrates, in a straightforward and entertaining manner, stories and legends of the Ancient Celts. There are stories about ghosts, fairies, witchcraft, changelings and other local beings and legends. But my favourites were the Ossianic legends, stories about the ancient and legendary heroes of Ireland, the Fianna warriors and their chief Fann Mac Cuil. If you like legends and myths, I highly recommend this short but very entertaining book. Honore De Balzac by Albert Keim and Louis Lumet. A biography of one of the greatest French novelists and playwrights co-authored by Albert Keim and Louis Lumet. They explore De Balzac’s childhood, his relationships with his family and the important women in his life, his business ventures that always seemed to end badly, his passion and zeal for his work and just every aspect of his life. The language is somewhat archaic but easy to understand and the book flows easily. I recommend it to all those who are interested in learning more about Honore De Balzac. Have you read any of these books? If so, what do you think of them?